The developers, who are in the early stages of redeveloping the vacant Clifton Cinema and adjoining supermarket site, held a two-day consultation showing what they have planned. Kath Howard, local resident offers this analysis following her visit; “… I went to see the exhibition of the plans for the redevelopment of the Clifton cinema site. It was on till 4pm Friday, and 10 – 2pm Saturday 14th. I’m just sorry it’s at a time when so many small traders in the town will be unable to attend. For what it’s worth, I have mixed feelings about this. In favour: the building will no longer be left to deteriorate and become even more of an eyesore. Also the art deco facade will be respected, if not preserved in every exact detail. 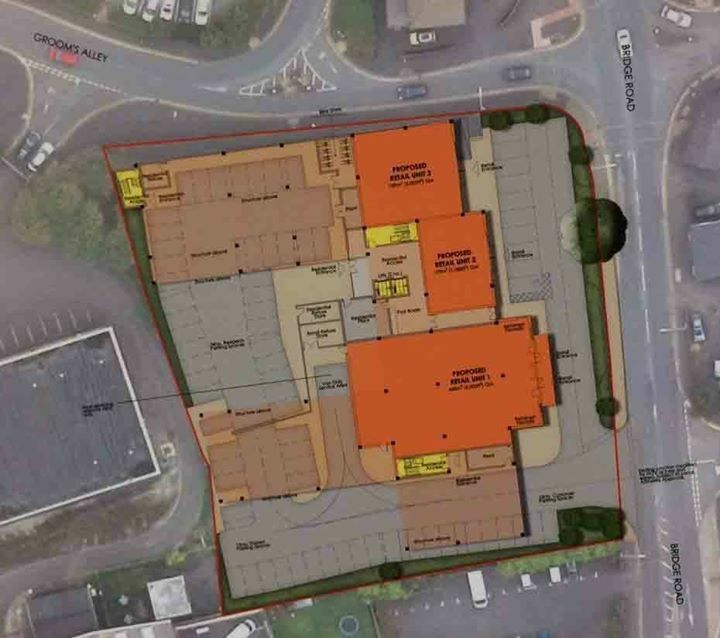 Concerns: the three large retail areas, in orange on the attached photo – given the number of empty shops in the town, I’m not sure there is much point in this, but presumably it’s all about how the developers make a profit. Number of residential units – again, this is all about profit, and why would the developers bother if not to make money? But 52 apartments, along with other nearby proposed new housing, seems a lot. The planning consultant there told me they’d discussed with T&W and made sure the infrastructure can support this. I’m not sure. Roads, doctors, schools etc. Section 106 money (that the developers have to contribute to local services and social/”affordable” housing). Preserving the frontage will be hugely expensive, including underpinning and asbestos removal. I suspect there won’t be much left for them to contribute, and it’s up to T&W where it’s spent. If the Madeley redevelopment is anything to go by, it won’t be in Wellington. ← Driving through Madeley and lost a bag? Anything they do will be better than it’s current state. The town centre is desperate for some regeneration. Good idea. However….the traffic situation would need sorting at the crossroads (market street, bridge street, aldi road). Trying to turn in to aldi is terrible from the morrisons side. Nobody ever lets you out and then the traffic backs up over the bridge. Add 70 ish cars to the equation wanting to turn in to the aldi turning and Wellington will be at even more of a stand still !!! I’m glad something is being done with it, though I question the need for retail units. Wellington is already struggling to fill its existing shops.